Professor Falmea recently asked us pirates what we would like to see added to Pirate101. I tweeted out my answer (crafting), but it also got me thinking about what else I would like to see added to the game. Here are my top 10 choices, in no particular order. Crafting - As I stated above, I would love to see crafting added to the game. I actually made a post about it awhile ago. In addition to gear and houses, it would be awesome to be able to craft our own ships! More packs - While I wouldn't want to see dozens of different packs on Pirate101 (like Wizard101 has) I think it would be cool to have Halloween and Christmas themed packs added to the game. I also wouldn't say no to a ship/nautical themed pack that offers an Epic ship and maybe the skiff mount. 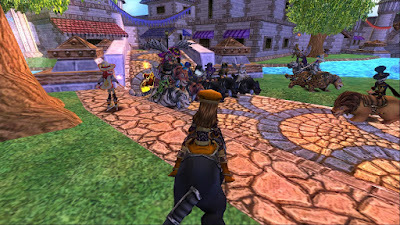 A side world - Wizard101 has a few side worlds and I think it would be awesome to have one or more in Pirate101 too. I have actually been working on some ideas and concept art for a Pirate101 side world for awhile and I hope to have that post out soon. Ship PvP - We can currently test our hand to hand combat skills against our friends and other pirates with PvP. How much fun would it also be to test our broadside combat skills with some ship PvP? Imagine up to 8 ships all battling 4v4 in a skyway arena, fighting it out to see which team is best. It would also give us another use for the team heal and the AoE ship equipment. I'm not a big PvP person, but I would love to try out ship PvP! Companion gear - We can already customize our companions a bit with which talents we choose to give them, as well as our flag color selections. However, I think it would be awesome to be able to customize them a little more with their own gear. Not anything huge, but maybe offer some different accessories we could equip to them to give a slight boost in their non class specific stats (health, accuracy, dodge, etc.) Accessories could include eyepatches, amulets, rings, maybe add a peg leg or a hook hand......Just something to set our companions apart from each other. One Eyed Jack companion - One Eyed Jack is one of my favorite NPCs. I was so happy when we got to revisit him later in the game for a side quest. It would be awesome if KI added a new side quest in a future world that would allow us to recruit him for our crew! Quest Finder - This is one of my favorite new features in Wizard101 that I would like to see added to Pirate101. For those of you not familiar with it, Quest Finder is an option in your quest log that you can click on and it will lead you to the nearest NPC that has a quest for you. It is so useful, especially if you're someone who likes to complete every single quest. 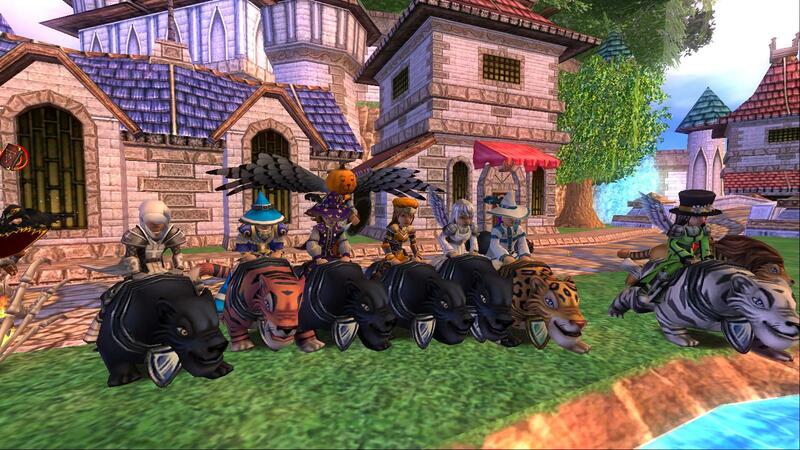 Daily Assignments/Events - This is another idea from Wizard101. I think it would be great for Pirate101 to have something like this to get people back in game on a daily, or at least more frequent basis. The more content available besides main story content, the more likely it is for people to log in consistently. Plus the daily assignments and events have awesome rewards and items you can farm for. A new high level turret boss - There are already 3 turret bosses in the game (in Cool Ranch, Mooshu and Marleybone) but I would love to see a new one added in either Aquila or Valencia Part 2. This one should be extremely difficult (for max level pirates), requiring multiple people to defeat it. The Marleybone one is pretty easy for max level pirates now. I am able to defeat it solo with my Aquila ship. It would also be awesome if the new one dropped unique ship equipment and lots of scrip, as well as respawning fairly quickly, making it great for NXP events. Doubloon vendor - Similar to the treasure cards vendors in Wizard101, I would love it if you could buy doubloons in Pirate101 from a vendor. Still have rarer ones drop from bosses and such, but have a selection for sale as well. It would also be nice to be able to sell and buy them at the Auction House. So those are the top 10 things I would like to see added to Pirate101. What would you like to see added? Comment below and let me know! Also be sure to comment on the post linked above and let the developers know as well!